So, yes, ahem… this happened! I am pleased to report though that the pictured plate of fried frogs was ordered not by me, but my husband. I am all for a culinary adventure, but couldn’t quite stomach the idea of supping on frogs. It’s just that on this occasion we were not in Rome, but in Dueville – a small town a short drive away from Vicenza – at a local festival called sagra. The theme of the sagra was water and all the goodness water provides us with. So, the food served was water-related too, frogs included. I had spent the whole day at home getting increasingly restless, so by 5 pm it was decided that we were to go out as a family and have some fun. As it was a national holiday though (2nd of June being Festa della Repubblica in Italy) and most things were closed, we looked online for some ideas what to do. And, what do you know? We came across Dueville’s water festival. Having had a great time at many a sagra, we piled in our little red car and the road led us outside of Vicenza, past a couple of splendid Venetian villas and all the way to Dueville. Yes, my husband made an Anglo-Italian joke! Great sense of humour and linguistic skills?! Reader, now you know why I married him! The sagra was held in yet another huge villa and as we walked through the entrance door, across the bar area and then into the sprawling backyard we saw a long line of people queuing to sample such delights as: fried baby trout, fried frogs, trout fillet, gnocchi, porchetta and polenta. Looking at our order form I was quite surprised to see that my husband had chosen a ‘piatto rane‘ – piatto meaning obviously a plate and ‘rane’ meaning (not so obviously) frogs. A brave man, indeed! Inside the white marquee long wooden tables flanked by narrow benches had been set up. It was really busy with people sharing tables, drinking, eating and talking. The noise was really deafening at first, but soon we more than contributed to its levels starting an animated conversation with our neighbours at the table. We gave our food receipt to the servers criss-crossing the large marquee and after about 20 minutes we were brought our plates. Immediately, I snatched my husband’s frogs and snapped several shots. When it was time to eat them though, I pushed the plate back to him. I have to say that we both were a bit taken aback when we saw the fried frogs. Honestly, I had expected that they would be serving just the legs. No such thing! The fried frogs, bar their heads, were piled high on the plate looking like they were about to jump. I was actually pleased that I had ordered the fried trout. It was very good, indeed! And the thick slabs of grilled white polenta it came with were really something. Plus, the bigoli (thick Venetian spaghetti) with trout and white asparagus we had gotten for our little daughter were delicious. We rounded off dinner with a frittella – a huge piece of thin crispy fried dough, generously sprinkled with sugar. As for the frogs… Let’s give credit where credit’s due. My husband munched his way through the plate. Purely for cultural research I plucked the courage and asked him to give me a leg. The tiny morsel of meat tasted a lot like chicken, but through the fried batter you could see the sinews stretched along the leg of what once had been a frog and it was all a bit off-putting. So, to conclude, let’s just say that it wasn’t something I would be in a hurry to taste any time soon again. Tell me, have you ever tried frogs? What is the weirdest foodstuff you have ever been brave enough to sample? Would you do it again? 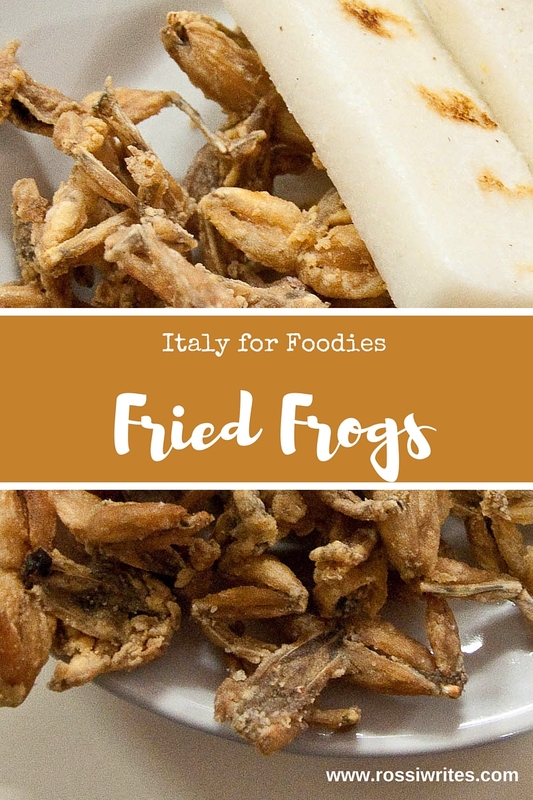 Great story, haven’t tried frogs myself, but they’re on my bucket list, even got a little higher to the top now due to the fact, that you shared they tasted a little like chicken (I LOVE chicken!). Come to Italy for frogs. And many other things, too.